Gradually, the MIAA High School Football season is beginning to unfold and week three once again brought with it plenty of intriguing headlines. No. 6 St. John's Prep showed it could have the makeup of an eventual Div. 1 North champion, as it went into Everett and played the No. 1 Crimson Tide tough before coming up just short, 26-14. Elsewhere, No. 2 Lincoln-Sudbury and No. 3 Catholic Memorial continued to roll while No. 4 Xaverian made a loud statement with a big win over New York power Archbishop Stepniac. The weekend was also marked with stellar defense showings. No. 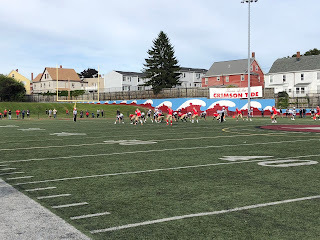 20 Tewksbury went on the road to BC High and shutout the Eagles on their home field highlighted by linebacker John Kelly. No. 5 North Andover stood its ground in a seven-point win over Central Catholic. No. 19 Hingham won the battle over No. 21 Whitman-Hanson, 22-13, but suffered a brutal injury with starting quarterback Jack Johnson going down with a broken collar bone. It was another banner weekend for kickers as sophomore Rayan Riazi tied the game with a 35-yard field goal before winning it with a 30-yarder in overtime to lead Revere to an upset win over No. 22 Lynn Classical. Side note: Congratulations to North Quincy who improved to 3-0 for the first time since 1996 with a win over Archbishop Williams. Lederman continued to show why he is considered one of top underclassmen in the state, finishing with 275 passing yards and four touchdowns to lead Natick to its first victory of the season, 42-14 over Walpole. Smith showed once again why he is one of the top play-makers in the region, reeling in 10 receptions for 153 yards and a touchdown to help improve the Rockets to 3-0 with a win over Newton North. Mentioned above, Riaza needs no introduction. The sophomore kicker drilled the game-time, and game winning field goal as Revere (1-2) upset No. 22 Lynn Classical. Dennis was electric from the opening kick-off, beginning the game with an 85-yard kick return for a touchdown before finishing the night with three total scores as St. John's Shrewsbury took down Leominster, 42-14. No one filled up the stat this weekend quite like Grafton running back Jackson Sonnett. Sonnett finished with five touchdowns, four on the ground and one viaa terrific 30-yard reception, to lead Grafton to a win over Shepherd Hill. Cann ran for an eye-popping 302 yards and four touchdowns to lead Austin Prep to its first win off the year, 36-0, over Matignon/St. Joseph's Prep. Smith finished Friday night with 320 total yards and three touchdowns to carry Pope John to a 41-6 win over Lowell Catholic. For a second consecutive week, Methuen showed it can put up the points with the best of them as behind three total touchdowns and 130 yards on the ground from Brutus, the Rangers defeated Lowell 35-28 in an MVC Large battle. Brutus caught the the game-winning 16 yard touchdown pass with 26 seconds left to keep Methuen undefeated at 3-0. Peete made sure Melrose bounced back from its loss to Lincoln-Sudbury in style as the senior back ran for 245 yards and three touchdowns in the Red Raiders win over Watertown. Harrington did all he could in leading Andover to its first win of the season. The Golden Warriors' freshman quarterback finished 13-of-14 for 145 yards and two touchdowns in a 38-14 win over Lawrence.